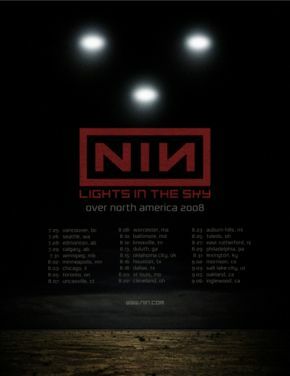 The Lights In The Sky Tour took place between July and December 2008 in North America and South America in support of Ghosts I-IV and The Slip. The tour was also essentially supporting Year Zero for the audiences it reached, as the Performance 2007 tour had not covered those parts of the world. Opening acts for this tour were Boris, The Bug, Crystal Castles, Deerhunter, Does It Offend You, Yeah?, HEALTH, A Place To Bury Strangers, White Williams and Vigilante. Confirming a very poorly kept secret, the band has been reformed (details coming!) and we are about to embark on an extensive tour. The first wave of dates I can mention at this time appear below. Many more to come! "I am proud to announce the final personnel lineup of nine inch nails for the foreseeable future. We've added, we've subtracted and we've wound up with unquestionably the strongest lineup I've EVER had. Joining me onstage will be Robin Finck, Alessandro Cortini, Josh Freese and Justin Meldal-Johnsen. We've been working on something really special for these shows and so far I couldn't be happier with the results. We'll be revealing some live performances shortly here on nin.com - in the meantime, we've posted some photos from rehearsals up on Flickr here. Meanwhile, I assume some of you may not be entirely familiar with the acts I've chosen to join us on various legs of this tour, so we've compiled a sampler EP for you. CLICK HERE to download this for free. If you like what you hear, be sure to show up early to the show (and please remember to support them by purchasing their music, if so inclined). 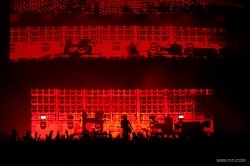 On November 20, 2008, a trailer for the tour was posted on nin.com. First, you’ll need to be a nin.com member to access presales. If you haven’t already, register for free at remix.nin.com (click “register” once you’re at the site), or log in with your Spiral username/password (Spiral members: If you’ve changed your Spiral pa ssword since November 2007, you may need to use your old password to login). Then, subscribe to the news feed, or keep an eye on nin.com for presale announcements. The first announcement, regarding the Lexington show, will go up tomorrow. When you purchase presale tickets, you’ll need to enter your legal name exactly as it appears on your identification. When you arrive at the show, there will be a special entrance for nin.com members. Present your ID at the entrance and you’ll receive your personalized ticket, which will have your name on it (no tickets will be sent out in advance). You’ll then have to enter the venue immediately. This process ensures that our presale tickets are purchased only by fans who are attending the show, and are useless to scalpers and ticket brokers. More specific presale information will be posted tomorrow and in the coming days. P.S. - purchasing presale tickets from nin.com will generally be less expensive than from public outlets. posted by NIN PR at 4:41 pm pst, from los angeles"
Show in Seattle on July 26, 2008. Show in Montreal on November 12, 2008. The production for the Lights In The Sky tour was one of the most ambitious for NIN, as well as the industry in general at the time. Rob Sheridan and lighting designer Roy Bennett worked with a company called Moment Factory to create unique and groundbreaking visuals that were at times interactive with Reznor and other members of the band. This was achieved with a set of "stealth screens" that would be raised or lowered during the set. 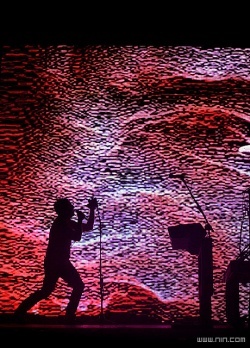 Among these effects were a static-like visual used for "Only", during which Reznor's movements could break the effect as if the lights were a physical barrier; a feed from a camera trained on Reznor during "The Greater Good" and "Closer" that created a surreal, almost 3D image of his face across the stage as he sang; and a large scale re-creation of a drum machine touch screen for Josh Freese to use during "Echoplex". Due to the tour being very production-heavy, the setlists were reasonably static. Many songs from The Slip and Year Zero were played, with "God Given", "Vessel" and "Meet Your Master" making their live debuts. Each show also featured a mini-set comprised of a rotating selection of songs from Ghosts I-IV, which always concluded with a version of "Piggy" that had been reworked to evoke the feel of the Ghosts instrumentation. Though it was not played in full, an instrumental portion of "Zero-Sum" was tagged onto the end of set closer "In This Twilight". The tour was originally planned to be documented in a 3D film by James Cameron, but this fell through and instead, a few shows were filmed by the NIN camp and the raw footage was made available to fans via a torrent. A fan collective known as This One Is On Us compiled the footage into a Blu-Ray and DVD release called Another Version Of The Truth: The Gift. This page was last modified on 16 April 2019, at 17:38. This page has been accessed 250,221 times.